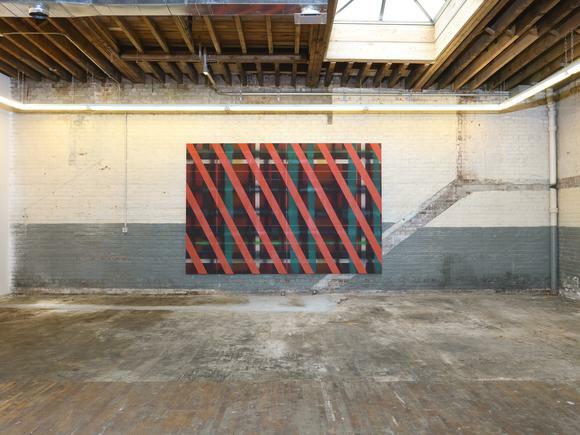 Cheim & Read is pleased to announce Sean Scully: Circa 70. This is a unique opportunity to view a little seen but surprisingly relevant body of work in a unique setting, a raw industrial space in Ridgewood, Queens. The space is in keeping with the itinerant, at times hardscrabble circumstances under which the paintings were made: a squat in an old railway building near London Bridge; a studio at Newcastle University; an annex of the Chelsea School of Art; the first floor of the now-demolished Hunt Hall at Harvard University, where the artist attended graduate school. The paintings mark a decisive turning point in Scully’s career, in which he broke away from the Neo-Expressionistic figurative paintings he was making as a student and struck out in a geometric mode of his own devising, a prolific, experimental series of works dominated by grids and stripes. In these works, a substrate of crisscrossing lines executed in brushed, rolled and sprayed paint merge into overlapping, irregular grids, which are overlaid with bold, solidly colored stripes. Sometimes the elements beneath the stripes are further complicated by gestural, wavering strokes, creating an emotionally fraught contrast with the rigorously geometric overlay—“AbEx incarcerated,” in the artist’s phrase. Elsewhere, the paintings are shaped, with a vector replacing the bottom edge of the canvas—a motif derived from camel straps the artist saw in Morocco—or, in one of the hybrid pieces he made while at Harvard, strips of colored felt are woven into a gridded wooden frame. Looking over the the arc of his career, Scully has remarked that the “balance of power” in his work has shifted from discipline to emotion, from the pent-up rigor of his early canvases to the sweeping, structured outpourings of his paintings today. Even so, there are innumerable pre-echoes of Scully’s current studio practice—his manipulation of the grid and his command of rolled paint, to name just two—in his experiments of the ‘70s. With their illusionistic depths alternately supporting and defying the boldly asserted picture plane, these paintings confound their decade’s expectations of flatness and reduction, and in doing so, they generate an electrical current connecting generations of painters. Scully was born in Dublin in 1945, and grew up in the south of London, where his family moved in 1949. Scully has shown extensively, both nationally and internationally, in venues including the Metropolitan Museum of Art, New York; the Philadelphia Museum of Art; the Lentos Kunstmuseum Linz, Linz, Austria; and Kunstmuseum Bern, Bern, Switzerland. Retrospectives of his work have been held at museums in Barcelona, Spain; Sainte-Etienne, France; Rome, Italy; Duisburg, Germany; and Belfast, Northern Ireland, and most recently in China at the Shanghai Himalayas Museum, Shanghai (2015); CAFA (Central Academy of Fine Art), Beijing (2016); Museum of the Nanjing University of the Arts, Nanjing (2016); Guangdong Art Museum, Guangzhou (2016); and in 2017, Hubei Art Museum, Wuhan.